Q: How do I print or look up legal cases? 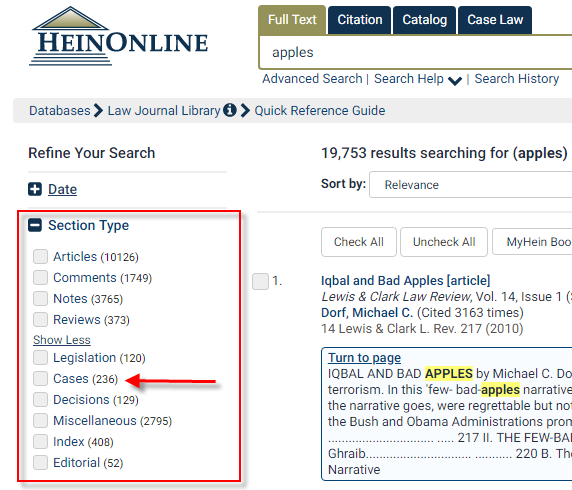 You can find legal cases in two databases at KSU: HeinOnline and Nexis Uni. You can find each database in our A-Z list of databases. After you open HeinOnline, click the "Case Law" tab. Enter the case citation (i.e., 265 U.S. 438) in the search box. If you don't know the case citation, you can search by keyword using the "Full Text" search. On the results page, use the "Section Type" menu on the left side of the screen to limit your results. Choose "Cases" to only view cases. You may need to click "Show More" to find the "Cases" option. After you open Nexis Uni, click the "Cases" button to search Federal or State cases. You can search by citation (Civil No. 07-1182(JNE/JJG)), by party (Kolodziej v. Mason), or by general topic. You can also click the "Criminal Justice" link to browse cases or search for statutes. For more detailed information on looking up legal cases, consult our Research Guide "How to do Legal Research."